The couple met at Emory University during Steven’s senior year and discovered quickly they are a classic case of “opposites attract”. Audrey’s Southern California laid back attitude clashed perfectly with Steven’s New York City aggressiveness. Luckily their mutual love of food bonded them together as they explored Atlanta’s rapidly emerging food scene during their first year as a couple. After Steven’s graduation and a year later Audrey’s, the couple moved to NY and have been together even since. For their 7 year anniversary, during a celebratory vacation to Hawaii, Steven surprised Audrey with a helicopter tour of the entire island followed by a private, romantic dinner on the beach and proposed to her at the water’s edge under the stars. Audrey and Steven describe their wedding, simply put, as “amazing”. 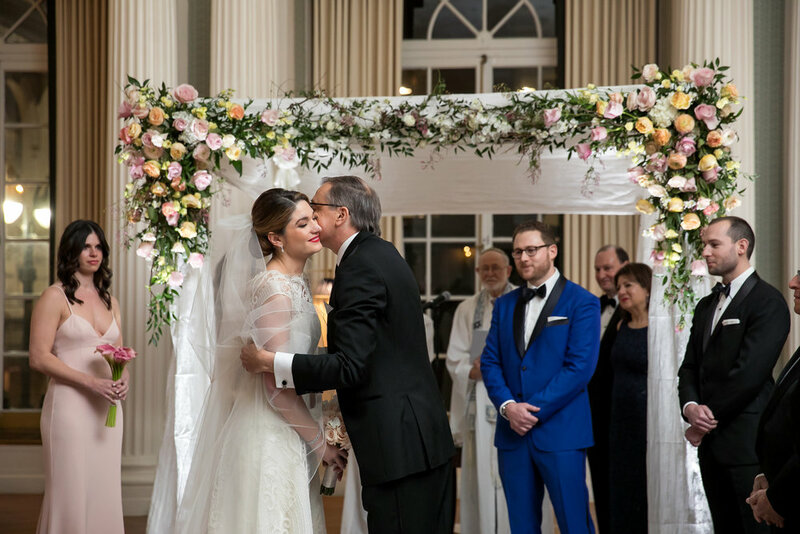 The Yale Club proved to be as timeless as they envisioned for their black tie affair with its ornate ballrooms and lounges. Despite the elegant columns in their ceremony space and the grandeur of the ballroom, they were still able to make their reception space feel romantic and homey with low centerpieces and elegant candlelight. Flowers: Fine Flowers by Kelly & Co.